Nowadays BB has ditched their operating system, but it is still alive in some of their best BlackBerry smartphones. And fortunately you can purchase it in India. The handset that we are talking about is the BlackBerry Z30. It is running on BB 10.2 operating system with 1.7 GHz Qualcomm dual-core processor. It is powered by a 2880 mAh capacity battery, which is said to last for a day at least. Talking further about the BlackBerry specifications, it has a 2GB RAM and 16GB internal memory which can be expanded via microSD card slot. Sporting a 5-inch Super AMOLED 1280 x 720 pixel resolution, it has one of the best viewing experience on a BB phone. 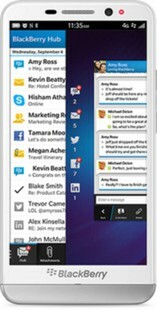 Blackberry Z30 (A10) full specs and reviews as of Apr 2019. Buy it here!